Alright guys, some of you may remember my old Celica build log. Well that poor car never had a chance . This one runs however, and is now a work in progress. I'm going to keep this OP updated with everything I do to the car. 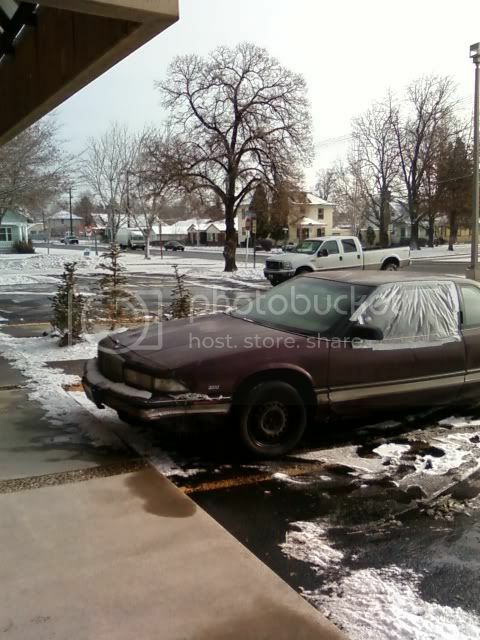 I started out with a beat up 1991 Buick Regal. I've had that poor thing for almost 5 years, and my grandma bought it brand new in 1990. Well this year for Christmas, I got $500. I said, I'm buying a new car with that money! So, I looked around on craigslist, and I found tons of hits in the sub $500 range. But nothing that ran decent....then I found this beauty. 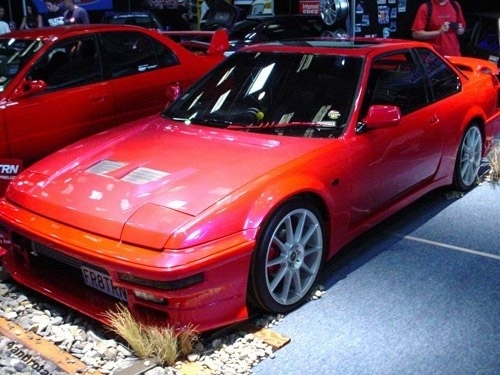 A 1987 Honda Prelude SI. The body is in good shape, the car runs great, it just needs a speedometer. So I paid $400 cash for it! So now, I've got some plans. I'm going to buy a used passenger side door. Also going to replace the windshield. Any dings will be filled in with bondo. 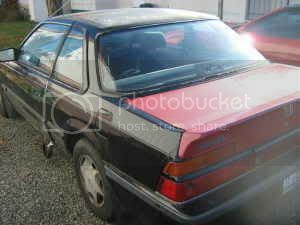 Then I'm going to paint the car black. The chrome trim on the bottom is going to be black (with the rest of the car) with the "Prelude SI" that is written in it...it will be in the same shade of orange as my blinker lights. 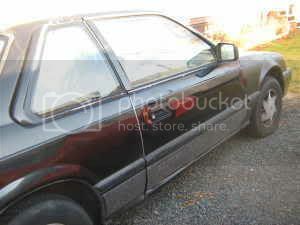 I will then put a "nice" set of rims on it (probably 15" or so). And a system. I'm not going to "rice it out" or anything like that. I hate Honda's just for that reason. I was also thinking of painting my brake calipers the same shade of orange and MAYBE adding a descrete spoiler to it (like in the picture below). Honestly, the picture below in my opinion is a very well done car. I would love for mine to look similar to that one day. Update list to what I have personally done so far to my car can be found on the 2nd post . Last edited by pioneerisloud; 09-22-2010 at 11:38 AM. 01-05-2010: Bought the car, opening pictures. 02-01-2010: Some good things, and some bad. 02-06-2010: The results of testing that TesteCull and BlackOmega had me do. 02-07-2010: Shifting problems are over, and the start of a VERY high end audio system . 02-11-2010: Speaker / Stereo Pron! 04-20-2010: Found myself a new mechanic for stuff that I can't handle (such as a busted wheel bearing). 05-02-2010: I REALLY hate local police....updated lights. 05-05-2010: New insurance coverage (not really part of the car, but applicable from last update). 05-31-2010: New fuel pump FINALLY. 06-01-2010: Better front stage . 06-03-2010: Interior Lighting fixed up. 08-24-2010: Completely new brake system! 10-06-2010: Planned update, some issues with moderators. 10-11-2010: Teaser for the next planned big update. 15 minutes estimated, 4 hours actual time. 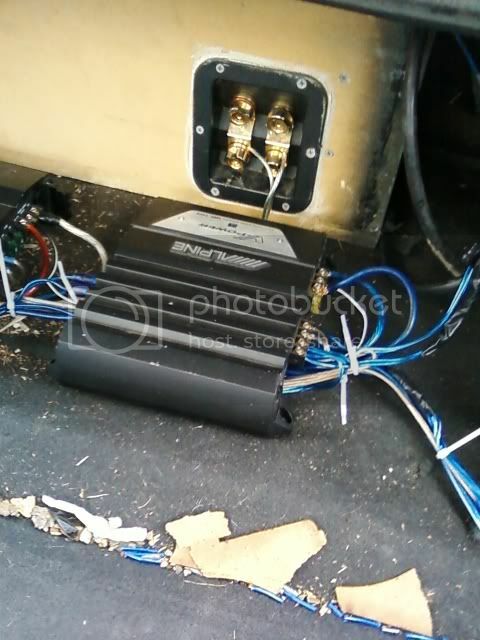 10-12-2010: Subwoofers reinstalled in the car with the 30Hz box! The table of contents is now fully up to date, and links here to this thread. Click the updates without worry. Stay tuned for more. Last edited by pioneerisloud; 10-12-2010 at 07:12 PM. Table of Contents is fully up to date. Please stay tuned....as I am nowhere NEAR done with this car yet. Last edited by pioneerisloud; 09-29-2010 at 08:27 PM. So today is the day I bought the car. Yes I know, I'm posting a little late. 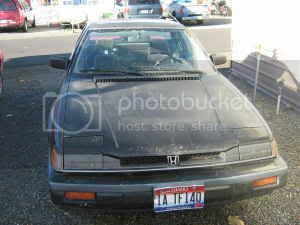 Here's the pictures right off the craigslist post that I bought the car from. 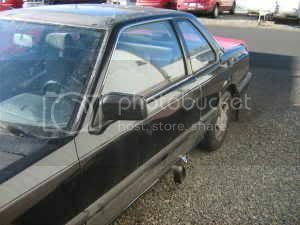 It needs a passenger door replacement, glovebox (its screwed...no latch), and a windshield to get the car started. More will of course follow....without ricing it out of course. Here's some pics...enjoy! More updates to come. Last edited by pioneerisloud; 09-25-2010 at 12:27 PM. Well somebody thought it would be a GREAT idea to slash all FOUR of my tires on my old car. This happened while it was parked in a parking lot for sale. Go figure! So I had to junkyard that poor old thing (it was about due anyway). Got $50 out of it, lol. I was generously gifted a Sony deck. I will not name names, but he is pretty well known around these parts . So, I also decided today to buy some speakers. I bought some Kicker DS5250's for my front doors. I also got my two channel amp out of the pawn shop finally to power them!!! So I've got the start to a great system! After buying all this stuff, something's wrong with the car. It won't shift into any gear without force. It doesn't grind (except reverse)...its just a royal PITA to get it into gear. Can take up to a couple green lights while sitting through them to finally get it into gear. So stay tuned, we should have some transmission or clutch shots coming up this weekend . I'll take some pics of the new equipment when I'm ready to install it. Well I don't know what this means guys, but TesteCull told me to try this. With the car in the air, I turned the car on. Put clutch in, put in gear, and the front tires just freaking took off! I mean they were REALLY spinning. I also found out this is a cable driven clutch, not hydrolic. So it looks like HOPEFULLY the cable is just stretched. I'm having a shop look at it on Monday for free. Also, transmission fluid is DEFINITELY full. We pulled the plug on the transmission, and fluid just started spewing out! So we're good there . And I'm not leaking a drop of ANY fluid at all for sure. Alright, another update time! I'm sorry guys, I do not have pictures. I REALLY wish I did for this one, but I won't have my camera back till next month . I'll take pictures then for sure! I also went down to Autozone and bought a speedometer cable. I pulled the old one out, and it was DESTROYED at the transmission. Its REALLY easy to put back in...so that should be done roughly Wednesday. Since I had some spare money leftover, I decided to buy a stereo . I ended up with a super el cheapo "Dual" head unit from Wal Mart. The thing cost me $40. 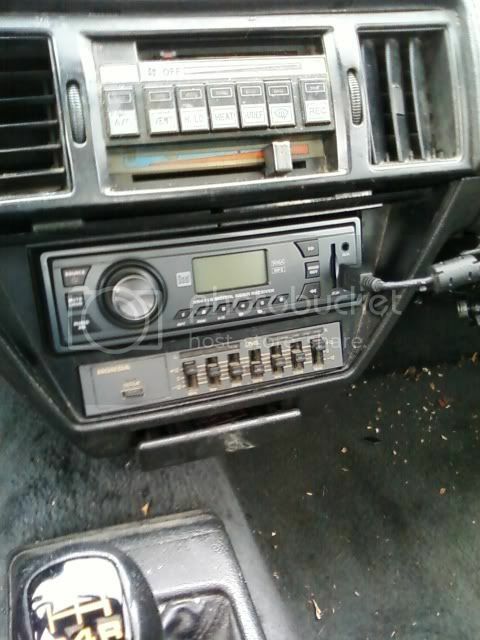 It doesn't have a tape deck OR a CD player. But it does have USB and a 3.5mm input. I also recieved as a gift today, some Pioneer Premier REV series 6.5" speakers (for those that don't know, those are by FAR the BEST sounding car audio speaker money can buy....or VERY close to it). Another gift I recieved was an Alpine 250w 2Ch. amplifier . So pair those up in the rear deck, I installed my Kicker 5.25" speakers in the doors (which will be powered by the amplifier), and I've got my 600w monoblock and Premier 2000SPL subwoofer. The stereo should be done tomorrow if I can find another 8ga power kit . Alright, so the car stereo is fully installed. Obviously I'm going to be upgrading it a little bit at a time. But its a GREAT start. It sounds REALLY clean. I pick up literally EVERYTHING from roughly 35Hz-20,000Hz. There is little to no dead frequencies at all. 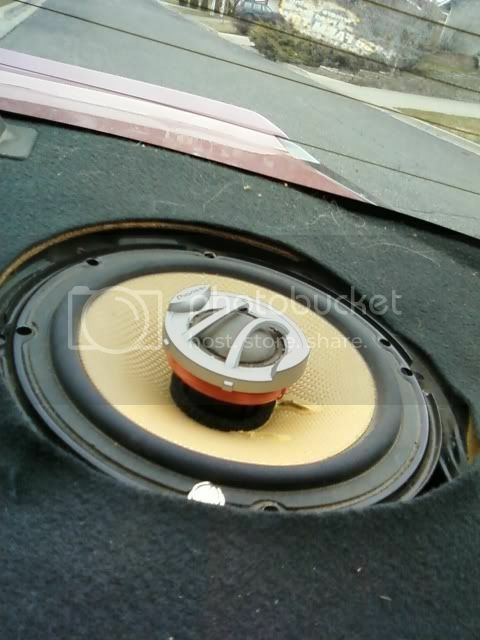 The sub picks up to roughly 100Hz in this car, and the speakers start to pick up around 80Hz. So, to start off, I had to run two sets of 8ga wire through the firewall. That was a pain. I also had to run new power wires to the head unit as well. The front speakers were a pain too. 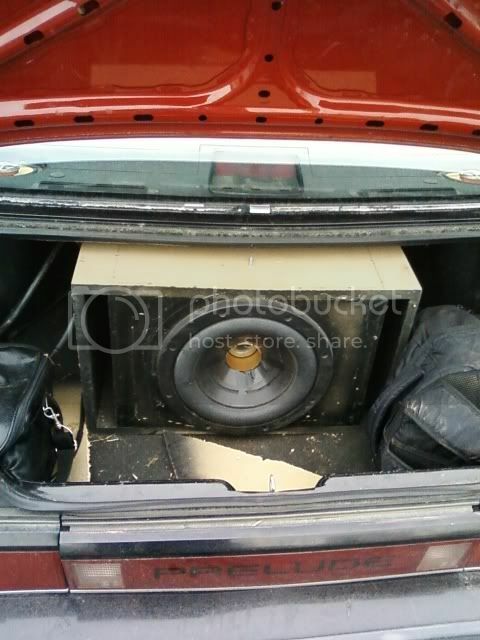 Evidentally my car came stock with 4" speakers in the door. So fitting 5.25" speakers was kind of a pain. But it worked out alright . The head unit was somewhat easy. I already had a single DIN spot. It was just the wiring that was hard because I had to run all new wiring. This unit is okay at best, only being $40 at Wal Mart. I just hooked up my mp3 player to the USB spot, and it works pretty well. The rear speakers are still a work in progress. There's only 3 screw holes in the rear deck to install speakers to. And these speakers need 4 screw holes to mount them properly, with the grilles. They sound REALLY clean though. I love REV series speakers. Now here's where things get tricky. The amplifiers. 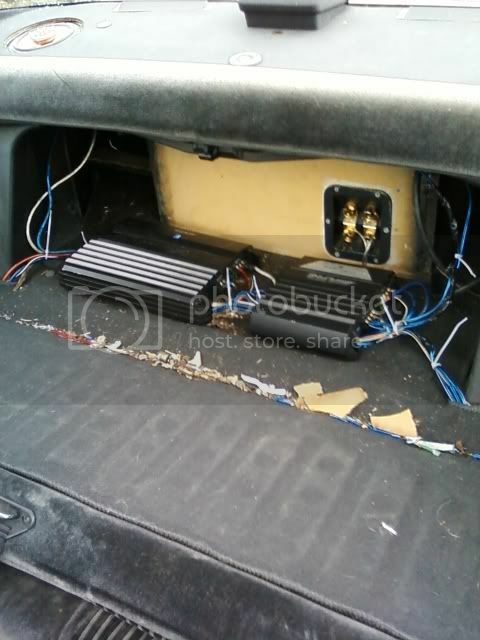 I started out just running the 2 channel to the front speakers, and the rears and the sub were wired together. Well, this resulted in me not being able to hear the rears at all!! So I wired all four speakers up to the 2 channel amplifier. The 2 channel amp is at 3/4 gain (yes, it takes THAT much to even hear the speakers over the subwoofer). I have the high pass filter on (80Hz). So they pick up the high bass and every thing else REALLY well. The subwoofer amplifier is set to 1/4 gain. Yeah....you read that right. 1/4 gain. Anything more than that, and I honestly cannot stand it inside the car. I'm not even pushing this subwoofer at all. And the subwoofer! This poor thing has been through hell and back. 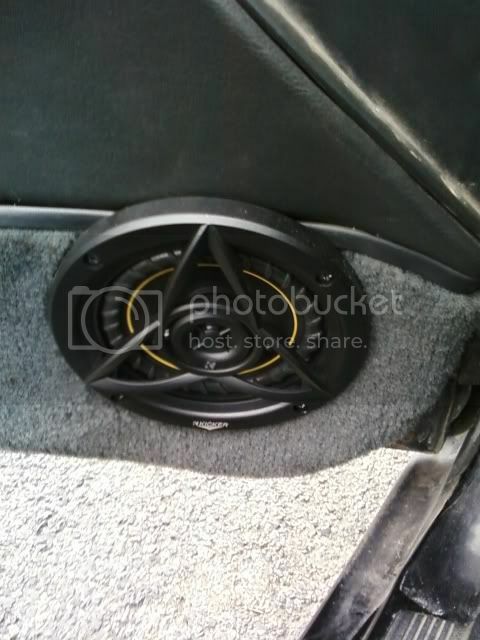 Its the ONLY thing left (other than the REV speakers) from my Celica build. If you're curious, please see my photo albums here on OCN. There's a tribute to my Celica build in there. Again, I'm not pushing this subwoofer even half as hard as it can take. And last but not least, a nice video of my subwoofer in action before the dustcap blew off. 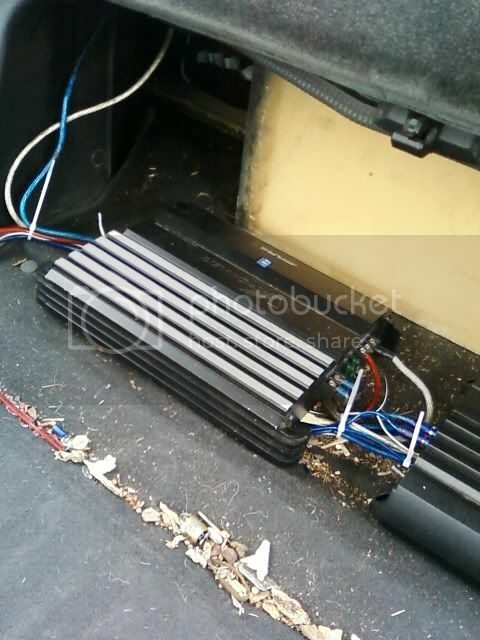 This was in my old Buick, running off the same amplifier (for reference). The subwoofer DOES still sound very clean. 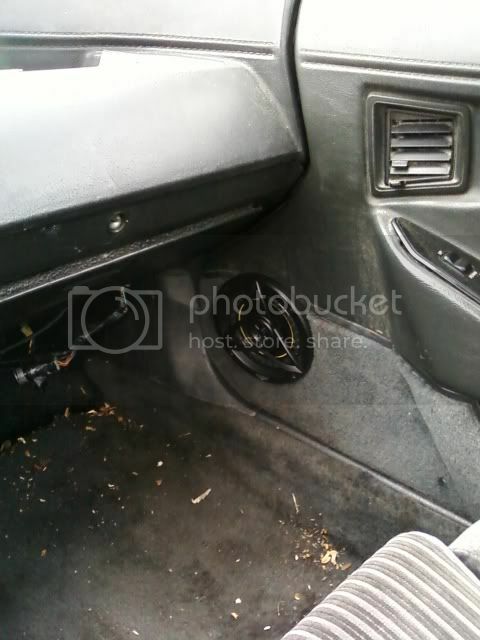 I know it doesn't look like much, since its missing the dustcap, but you cannot tell that its blown from inside the car. You still need to get that timing belt changed. Yes, I know that . I'm still not comfortable ripping apart my entire engine though to do it. I'm hoping my current one will last until Christmas time roughly (I think it will). I'll get it changed then .